Now as the govt. has freed any restriction to Bharat Ratna categories and now person from all field are eligible to get Bharat Ratna award, the debate now starts again on who should be given Bharat Ratna first? To this list some of the name that are coming are Dhyan Chand former Indian Hockey pleyer used to play for Indian Army team before the freedom of 1947. 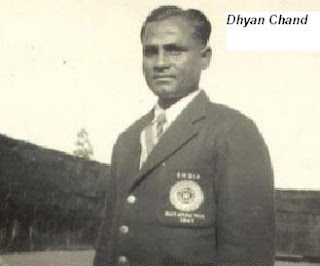 Major Dhyan Chand is credited for taking Gold medal in three consecutive olympic games that is 1928 in Amsterdam, 1932 in Los Angeles and 1936 in Berlin Germany. Major Dhyan Chand is also the recipient of Padma Bhushan in the year 1956 while he was of age 51. The same year he was promoted to the major post in Army through punjab regiment. To Dhyan Chand's memory his birthday 29th August is being observed as the national sports day in India. On this day National sports day different awards like Rajiv Gandhi Khel Ratna award, arjuna award and Dronacharya award are given to the players who shows exceptional sports in their fields. So, with this Major Dhyan Chand comes to the mind for bharat ratna as #1. Second is Master Blaster Sachin Tendulkar, even if I don't write anything about him, its enough, his name is known to all indians and even the world salutes him as the best cricketer in the world. He has the highest number of records under his name. So, Sachin Tendulkar too can't be compared lesser. But due to Dhyan Chand's seniority Dhyan Chand should be preferred over Sachin. And next year Sachin should be conferred the same. Third name which is coming is the Indian Grand Chess Master and the current world chess champion Vishwanathan Anand. Though his talent too can't be compared lesser but if the award like Bharat ratna is seen I think Vishwanathan Anand need to wait two more years. May be 2013th Bharata Ratna be conferred to him only.